Already own a home in the River Trace subdivision? Thinking of selling? Click here and read about current search trends & our web network. River Trace homes in Foley, AL are centrally located near downtown and a short drive at approximately 10 - 15 minutes from the beaches in Gulf Shores, AL. The new express way cuts all the way to I-10 making the trip to Orange Beach and the interstate quick and easy and fairly traffic-free. River Trace is near numerous area restaurants, entertainment venues and shopping outlets. Homes for sale in River trace are in the $150,000 range and sure to go up in the near future. 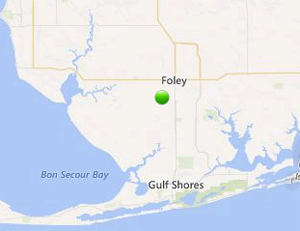 River Trace are close to Foley High School and a relatively easy trek to both regional airports in Mobile, AL and Pensacola, FL. Please let us know if you would like additional info for River Trace homes, such as: additional pictures, recent sales info, subdivision bylaws or anything else. Send emails to info@condoinvestment.com or call (251) Area-Pro (251-273-2776) for immediate assistance or to make appointments to view current homes for sale in River Trace subdivision in Foley, AL. Listing information last updated on April 22nd, 2019 at 11:16pm CDT.